Alport syndrome is a hereditary progressive glomerulopathy characterized by hematuria and proteinuria. The disease is caused by a gene mutation and affects the production of collagen type IV, which is an abundant component of the glomerular basement membrane. The mutations disrupt the glomerular basement membrane, leading to progressive glomerulosclerosis and end-stage renal failure. The condition causes hemorrhagic nephritis associated with extrarenal manifestations such as deafness and ocular changes. The X-linked form of this disease is the most common and mainly affects males. Typical ocular findings are dot-and-fleck retinopathy, anterior lenticonus, and posterior polymorphous corneal dystrophy. Some cases involving polymorphous corneal dystrophy and corneal ectasia have been previously described. The less common autosomal dominantly and recessively inherited form can affect females too. The diagnosis relies on clinical findings such as macrohematuria combined with renal biopsy showing a thinning/thickening of the glomerular basement membrane with a longitudinal splitting of the lamina densa, and genetic testing. However, Alport syndrome has recently shown to be more clinically variable than expected. Therefore, it is advised to perform genetic testing also whenever histopathological analysis is not in favor of Alport syndrome diagnosis, since patients may present with multiple episodes of isolated macroscopic hematuria and normal electron microscopy analysis of the glomerular basement membrane. The disease may also begin with proteinuria, progressive renal failure and haemolysis, but without overt haematuria or hearing loss. 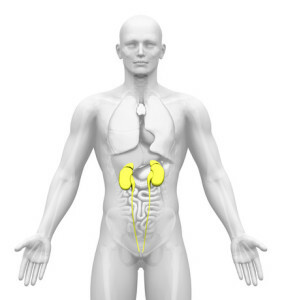 Mutations have been identified in the COL4A5 gene in Alport syndrome and in the COL4A3 and COL4A4 genes in Alport syndrome and thin basement membrane nephropathy (TBMN)*. To date, more than 1000 different mutations in COL4A5, COL4A3, and COL4A4 are known. COL4A5-related Alport syndrome is X-linked, whereas COL4A3 and COL4A4-related Alport syndrome can be autosomal dominant or autosomal recessive. Both point mutations and large deletions/duplications have been described in the Alport-associated genes. Rare cases of co-occurrence of Alport syndrome and Klinefelter syndrome have been described in male patients harbouring a homozygous COL4A5 mutations. *Thin basement membrane nephropathy (TBMN) is characterized by microscopic hematuria, is largely asymptomatic, and is rarely associated with proteinuria and end-stage renal disease. No treatment is available today , but promising experiments in mice have been done with chorionic stem cells (CSC). When transplanted into Alport mice, a single intraperitoneal injection of CSC significantly lowered blood urea and urine proteinuria levels and nearly two thirds of transplanted mice maintained their weight above the 80% welfare threshold, indicating that indicate that CSC may be used to delay progression of renal pathology via a combination of anti-inflammatory effects and potentially replacement of the defective resident podocytes. The differential diagnosis of Alport syndrome include Fechtner/Epstein syndrome, characterized by the association of hereditary nephritis, sensorineural deafness, cataracts, and the triad of the May-Hegglin anomaly (thrombocytopenia, large platelets, and characteristic leukocyte inclusions – “Döhle-like” bodies). Fechtner/Epstein syndrome is caused by mutation in MYH9. Overall, it should be remembered that the most common causes of isolated microscopic haematuria among children and young adults are IgA nephropathy, Alport syndrome, and thin basement membrane nephropathy (TBMN). In atypical cases the initial diagnosis may be chronic thrombotic microangiopathy, but negative testing of candidate genes for steroid-resistant nephrotic syndrome and congenital thrombotic microangiopathy help in the differentia diagnosis. Posted in Academia, Disease cards, Last Update, Medical Genetics and tagged Alport syndrome, COL4A3, COL4A4, COL4A5, MYH9.